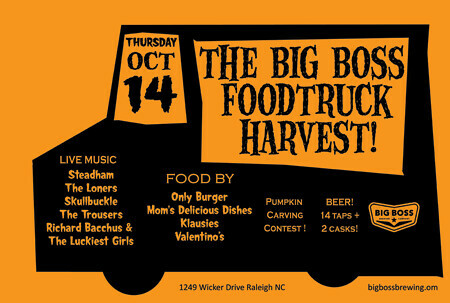 The Big Food Truck Harvest at Big Boss Brewing in Raleigh is scheduled for October 14th from 5-10:30pm. Come on out and celebrate the season with and one of their most popular brews, Harvest Time Pumpkin ale, along with the Triangle area’s best food trucks, and great local rock bands. Here is the scoop on the Pumpkin Carving Contest. The folks at Big Boss are looking for creative carvings to be judged and displayed at our Big Food Truck Harvest on October 14th. Anything goes for this one. They are looking for Pumpkins that celebrate the season . funny, scary, beery. be creative! Pumpkins must be delivered on the 13th of October during normal business hours (5-midnight). Prizs will be awarded for the best pumkins! We are lucky enough to have a great line up of local rock bands! Confirmed so far: Steadham, Skullbuckle, The Trousers are all on board. I’m all about supporting the food truckers any way possible. I put up on station website. Thanks for helping spread the word with your listeners on 100.7 The River. Appreciate you stopping by and checking out my blog. Thanks!